Question: I just heard 2014 was the hottest year on record, but didn't this blog just say that it was the coldest year since 1980, what gives? Answer: Yes many different agencies just announced that have recorded 2014 as the warmest year on record and our data show that it was the coldest year locally since 1980. 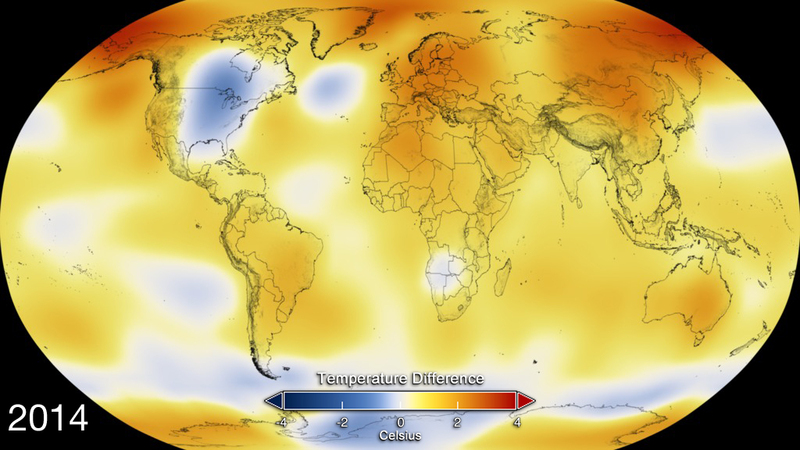 What is important to remember is that our region makes up only a small part of the planet and although we had a very cold year, globally the temperature was well above average. So both statements are correct, just for different scales. I knew that last winter was cold, but I was a bit surprised to find out that 2014 was the coldest year overall since 1980 at 0.8 degrees below average. After the winter, the rest of the year actually wasn’t all that remarkable, but the frigid temperatures we saw early in the year were enough to drag down the annual average. The start of the year was remarkably cold, January, which was over 3 degrees colder than average, was followed by 2 months that were colder by more than 5 degrees. It was the coldest February since 1979 and it was the second coldest March in the 100 year history of records in the region. The low of -31.2 °C on February 12th was the coldest temperature since January 27th, 2005 and the second lowest February temperature recorded in the region (the coldest being all the way back in 1934). April was still cold, but then May and June finally brought us some warmer than average months. But any hopes for a warm summer were dashed with a cold July and average August. The fall actually turned out to be pretty warm ending with a December that was the most above average of any month of the year. Although the entire winter was memorable, of particular note was January 7th. It was not the coldest day of the year, but the combination of temperature and wind made the windchill equivalent temperature -40.2, which was the lowest value we have seen since the UW weather station was established in February of 1998. The other distinction of this day was that the high temperature only got up to -18.7 °C, you have to go back to January 19, 1994 to find a day when the high temperature was that low. For precipitation, the total for the year of 949.6 mm was just 45.6 mm more than the average of 904.0 mm. The first few months of 2014 were a little bit drier than average and these were followed by some average months. The months of July (5th wettest) and September (3rd wettest) put the total back above average. However, the last few months were dry putting the final total back into the average range. The most significant day for precipitation was August 2nd. Interestingly the total for the day wasn’t that spectacular at only around 60 mm, however, this storm resulted in the highest 15 minute (23.7 mm) and 1 hour (57.4 mm) precipitation values in the history of the UW weather station. Looking at the MTO website that calculates Intensity Duration Frequency Curves ( link to MTO site - developed with the help of the Civil Engineering department of the University of Waterloo by the way) the one hour total has less than a 1 percent chance of happening any given year (commonly referred to as a 1 in 100 year storm, but I don’t like that terminology). You can see just how intense and isolated the storm was in this radar loop from Environment Canada (link to EC radar loop for August 2nd – hit the play button to see the loop). As always the total snowfall for the calendar year is kind of a strange statistic as it straddles 2 different snowfall seasons, but nonetheless we got 148 cm during 2014 compared to an average of 159.5 cm. The warm weather we saw around Christmas and the lack of really cold temperatures helped make it a very warm month overall. For the entire month of December the temperature was 2.7 degrees higher than average. This is a lot higher than average, however you only have to go back to 2012 to find a December that was even hotter. With only 33.3 mm of precipitation, not only was it much less than the average of 80.4 mm, it was also the driest December since 1960 when there was 31.2 mm. Of this precipitation, we only saw 5 cm of snow, this is the lowest December snowfall we have seen in the 100 years of records in the region.